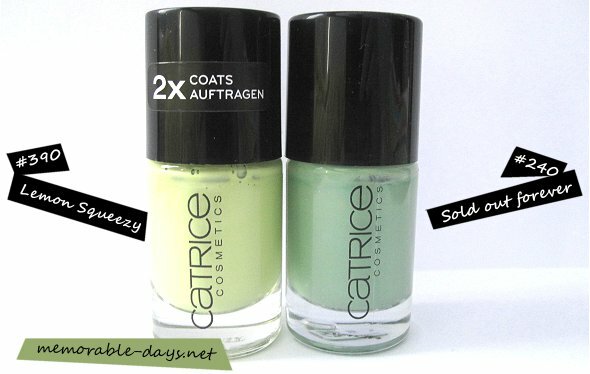 Catrice swatches - Am I blue or green & Lemon Squeezy | Memorable Days : Beauty Blog - Korean Beauty, European, American Product Reviews. 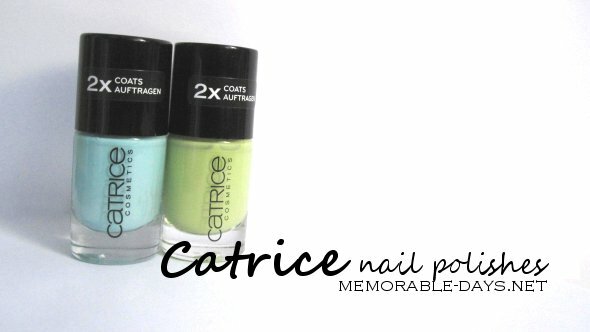 I was really curious about the new nail polish collection of Catrice (Ultimate nail lacquer) so I went to the Dutch drugstore a few days ago and picked up a few nail polishes. Gosh, I want to buy the whole nail polish collection because they are all so pretty ♥. I even saw a few pastel colors :) I grabbed those right away when I saw it. It's definitely light blue! I'm loving this color cause it makes me think of the blue sky and it also makes me think of the bumble bee nail art tutorial that bubzbeauty posted on her channel. It's the same kind of blue. Such a funny name ^__^! It's a light version of the #240 Sold out forever of Catrice.You can see the difference below. They are €2,49 each and are of great quality and packaging. Both nail polishes are quite thick. I usually apply two coats to make it look perfect (without any stripes). These are definitely worth the money ^__^! Oh, echt te mooi! Ik wil beide ook echt heel graag! Me ♥ Catrice! @Prisje, hmm had je in de stad gekeken? meestal bij rembrandt hebbe ze wel vaak de hele collectie, misschien daar proberen? Weetje hoe grappig, Maud van Beauty Before Breakfast heeft vandaag precies over dezelfde combinatie een artikel gemaakt! 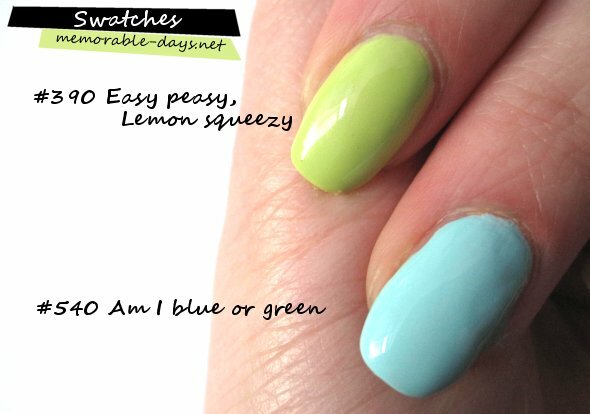 http://tinyurl.com/nailpolish2 Leuk! Easy Peasy, Lemon Squeezy is superleuk! Ik krijg nu wel de neiging om ze zelf ook te kopen hahah! @Nic nic, haha =D i'm loving pastel colorss !!! Helemaal niet duur ook... Waar heb je ze gehaald? Kruidvat?